It was an overcast, drizzly afternoon in Brooklyn...perfect Autumn conditions to check on arriving waterfowl in Prospect Park. I followed the park's waterways, beginning at the Fallkill Falls, past the Upper and Lower Pools, through the Ravine and Ambergil pool, to the Lily Pond and Binnen Falls, along the Lullwater and finally, the shoreline of Prospect Lake. One of the brilliant illusions of Omstead and Vaux's design is that the various ponds, streams and lake appear to be all separate features when they are all actually one meandering body of water fed by the city's water system. At the Lower Pool a small flock of Wood Duck hugged the shoreline beneath low hanging oak boughs. Farther along the waterway were the usual collection of park Mallards and mutts. I encountered my first flock of Northern Shovelers at the Lullwater. Where the watercourse widens beneath the Terrace Bridge was a nice mix of Gadwall, shovelers, Ruddy Ducks and several coots. A Belted Kingfisher rattled from somewhere near the Peninsula. The water's final destination at the 11 acre Prospect Lake was where the greatest diversity of waterfowl was today. In addition to another pair of Gadwall, many more shovelers and Ruddy Ducks (plus the odd assortment of Canada Geese, Mute Swans, Mallards and hybrid domestic duck) was a flock of 9 Ring-necked Ducks. Tucked into the close knit flock, and looking a bit out of place, was a tiny female Green-winged Teal. As this is only the start of waterfowl migration, I expect to see a greater diversity of duck on Prospect Lake in coming weeks and certainly greater abundance, especially Northern Shovelers. Autumn around New York City is a good time to find migrating Blue Grosbeaks. Possible identification problems with this bird, however, is in its similarity to the Indigo Bunting or when viewing either females or young males. Both the Blue Grosbeak and Indigo Bunting males are brilliant blue birds with relatively large bills. On closer examination, though, there are some fairly obvious differences. • The male Blue Grosbeak has two rusty wingbars. While not as pronounced as on the males, the tan-colored females will also show two brownish wingbars. • Neither the male nor female Indigo Bunting has wingbars. • Blue Grosbeaks have a large, heavy bill, the top edge of which nearly forms a straight line into the forehead. • Indigo Buntings have a much smaller bill. • The large, squared off head of Blue Grosbeaks give them a block-headed appearance. • The head of Indigo Buntings are rounded and more delicate. • At 28 grams, the average Blue Grosbeak is nearly twice the weight of an Indigo Bunting (14.5 grams). 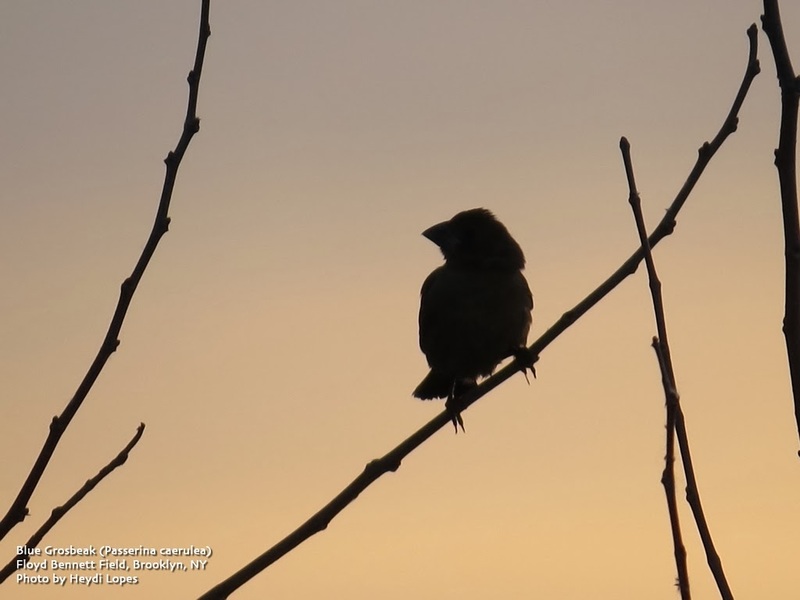 So how does one determine whether a backlit bird, seen in silhouette, is a Blue Grosbeak or an Indigo Bunting? The bill and head should be a dead giveaway. Here's a good comparison page of the two species. Hundreds of oils spill in North Dakota kept from the public. The following was just reported by the Associated Press. BISMARCK, N.D. (AP) — North Dakota, the nation's No. 2 oil producer behind Texas, recorded nearly 300 oil pipeline spills in less than two years, state documents show. None was reported to the public, officials said. Dennis Fewless, director of water quality for the state Health Department, said regulators are reviewing the state's policies for when to publicly report such incidents after a massive spill was discovered last month in northwestern North Dakota by a wheat farmer. State and company officials kept it quiet for 11 days — and only said something after the AP asked about it. Dave Glatt, chief of the department's environmental health section, said the website announced late Friday would likely go live in two to three weeks. He said officials are still considering how large a spill should trigger a public announcement in addition to being published on the website. Between coffee-shop talk and chatting with neighbors, nothing much happens around the fourth-generation farmer's land without him knowing about it — except when it comes to oil spills. Records obtained by the AP show that so far this year, North Dakota has recorded 139 pipeline leaks that spilled a total of 735 barrels of oil. In 2012, there were 153 pipeline leaks that spilled 495 barrels of oil, data show. A little more than half of the spills companies reported to North Dakota occurred "on-site," where a well is connected to a pipeline, and most were fewer than 10 barrels. The remainder of the spills occurred along the state's labyrinth of pipelines. North Dakota also had 291 "incidents" this year that leaked a total of about 2,209 barrels of oil. Data show that all but 490 barrels were contained and cleaned up at the well site. In 2012, there were 168 spills reported that leaked 1,089 barrels of oil; all but 376 barrels were contained on site, data show. Only one incident — a crash involving an oil truck last year — was reported publicly. Department of Mineral Resources director Lynn Helms — the state's top oil regulator — said regulators worry about "over-reporting" spills. The goal, he said, is to find a balance to so that "the public is aware of what's happening but not overwhelmed by little incidents." "It would tell me if there is enough oversight and why these accidents happen and if they could have been avoided," he said. "Right now, you don't know if there is a spill unless you find it yourself." Join the American Littoral Society's Northeast Chapter for a Low Tide Beach Walk in the Rockaways. Meet at the Bathhouse Entry Pavilion in Jacob Riis Park and walk the beach with naturalist and local expert, Mickey Cohen. You will learn the science behind beach dynamics and check out the flotsam and jetsam on this stormy beach along with learning about the extraordinary aeronautical and military history of the area. Walks are for beginners and experienced birders alike. Weather permitting, walks start at 9:30 a.m. unless indicated otherwise. If in doubt, call the trip leader. Please note: all phone numbers are code 516 unless otherwise shown. In most cases, your contacts are the trip leaders. Saturday, November 2, 2013, 9:15 a.m. to 3:45 p.m.
Come join others who enjoy a crisp autumn day outdoors. Ten moderate miles at a comfortable pace. We are starting out at Willowbrook Park. Meet at Willowbrook Park at the Victory Boulevard entrance parking lot near the ballfields. Bring lunch and beverage and sturdy walking shoes. We go in all weather, but walk is shortened if high pollution levels occur. For more information call Dominick Durso at 917-478-7607, Charles Perry at 718-667-1393 or Don Recklies at 718-768-9036. Saturday, November 2, 2013, 4:00 p.m. to 6:00 p.m.
North Mt. 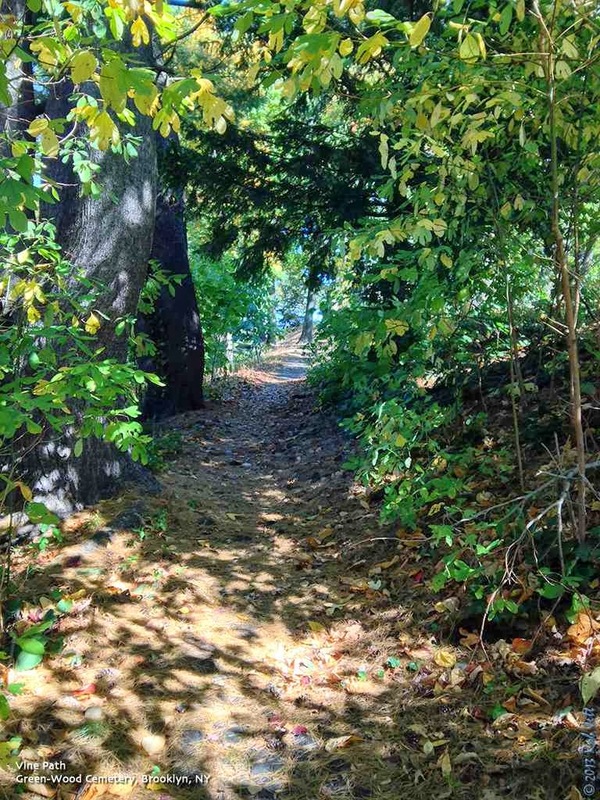 Loretto State Forest – Participants will observe a variety of ecosystems and study the interconnectedness of nature as they search for evidence of animal life, the geologic history and human influence of this diverse area on the south shore. Meet at the parking lot for North Mt. Loretto on Amboy Road in Richmond Valley. Greetings. This is the New York Rare Bird Alert for Friday, October 25th 2013 at 8pm. The highlights of today's tape are FRANKLIN'S GULL, AMERICAN AVOCET, EURASIAN WIGEON, LARK SPARROW, CLAY-COLORED SPARROW, BLUE GROSBEAK, DICKCISSEL and RED-HEADED WOODPECKER plus a pelagic trip announcement. An interesting Fall week was highlighted by the discovery of an immature FRANKLIN'S GULL found amongst a large group of Laughing and other gulls along the beach between parking fields 2 and 3 at Robert Moses State Park on Wednesday morning. The bird ultimately moved off due to beach activity and could not be relocated subsequently. Birders should note at least 5 LESSER BLACK-BACKED GULLS though. Perhaps more bizarre were 3 AMERICAN AVOCETS photographed floating a short ways offshore on the ocean off the Roosevelt Nature Center at Jones Beach West End last Sunday morning. They flew off after a short swim. As the variety of waterfowl increases locally 2 EURASIAN WIGEON were reported last Monday, one on the main pond at Connetquot River State Park in Oakdale and one on the Sayville Mill Pond off Montauk Highway. COMMON EIDER was also noted Monday in Brooklyn in the bay on the east side of the Gil Hodges Bridge at Floyd Bennett Field where a BLUE GROSBEAK was seen last Saturday and Sunday. 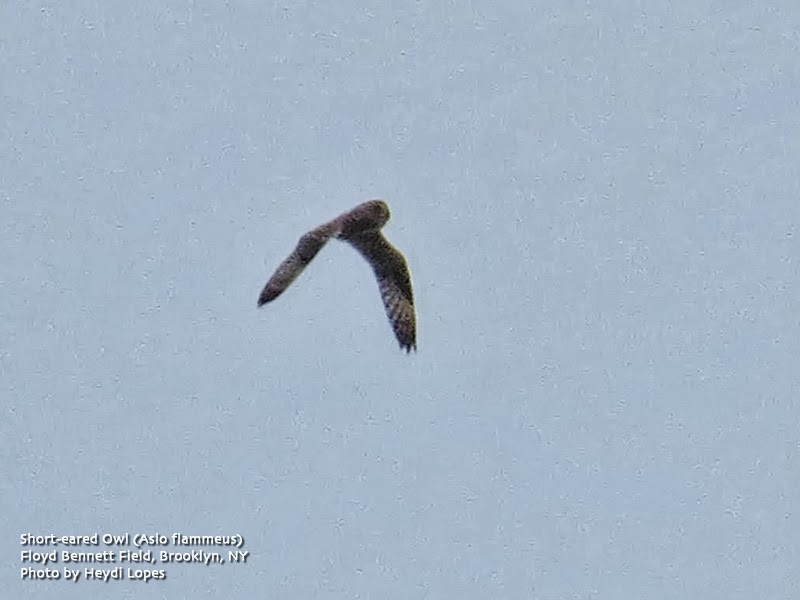 One of the first arriving SHORT-EARED OWLS was at Floyd Bennett Field last Saturday. 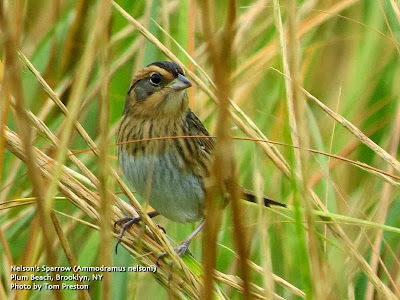 Riis Park provided GRASSHOPPER and NELSON'S SPARROW plus a tardy BOBOLINK last Monday when another GRASSHOPPER SPARROW was noted at Kissena Park in Queens. A CLAY-COLORED SPARROW was at Green-wood Cemetery in Brooklyn Sunday and VESPER SPARROWS appeared at Canarsie Beach Park in Brooklyn Tuesday and Oakland Lake in Queens on Wednesday. The SORA now apparently more secretive was still being seen Wednesday in the swamp along Prospect Park Lake. At Kissena Park in Queens Saturday an ORANGE-CROWNED WARBLER was in the corridor and an immature RED-HEADED WOODPECKER was still present. Up to 3 more RED-HEADED WOODPECKERS were still residing near Turtle Cove at Pelham Bay Park in the Bronx at least through Wednesday and another was seen at Jones Beach field 10 last Saturday. Among the birds at Jones Beach West End last Saturday were a LARK SPARROW briefly at field 2 and a breeding plumaged RED-THROATED LOON off the Coast Guard Station. Over a dozen ROYAL TERNS were also in the inlet with 25 counted that day at Jones Beach field 6 these numbers continuing at least to Wednesday. At Robert Moses State Park single CLAY-COLORED and LINCOLN'S SPARROWS were near the field 2 volley ball courts last weekend and a DICKCISSEL and a HOODED WARBLER joined other birds feeding on the lawn by the maintenance buildings that day. Out east a LARK SPARROW was present in the overflow parking lot by the Ponquogue Bridge west of Shinnecock Inlet from at least Monday afternoon to Wednesday. Recently arriving species have included SNOW GOOSE, LONG-TAILED DUCK, HORNED GREBE, GREAT CORMORANT, PURPLE SANDPIPER and FOX SPARROWS [along with various warblers and lingering species with a few species of thrush other than Hermit] continue to be seen. A 12 hour pelagic trip will leave Freeport Long Island at 6am on Saturday November 23rd aboard the Captain Lou VII an excellent birding vessel. The cost is $185 per person. The trip is sponsored by See Life Paulagics. For information visit their website at < http://www.paulagics.com/ > or for reservations call (215) 234-6805. 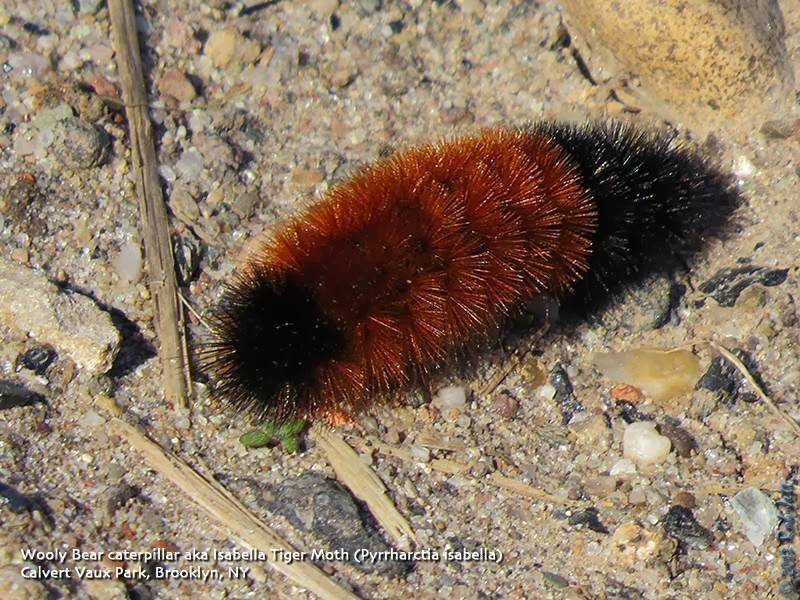 Over the past couple of weeks Woolly Bear Caterpillars have been appearing all around the area. Legend has it that this larval form of the Isabella Tiger Moth (Pyrrharctia isabella) is a predictor of the coming Winter's severity. Supposedly, the wider the orange segment, the milder the Winter. In reality, individuals from the same clutch of eggs show a wide range of band sizes, plus, the bands grow with the age of the caterpillar. Their host plants include asters, birch leaves, clover, corn, dandelions, elm leaves, maple leaves, sunflowers, and nettles. The larval stage overwinters, where its entire body freezes, protected by a cryoprotectant, then thaws in the Spring to emerge, become a moth, mate and start the process over. Cuckoos eat Woolly Bear caterpillars. 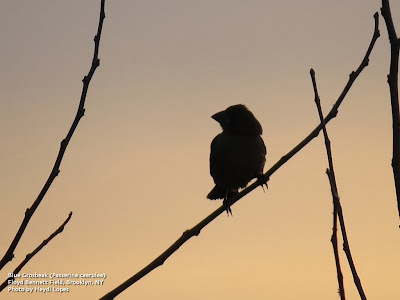 Last weekend we spotted several good birds in Brooklyn, plus there was an overall marked increase in sparrow species, as well as, the arrival of some of our typical overwintering waterfowl species. 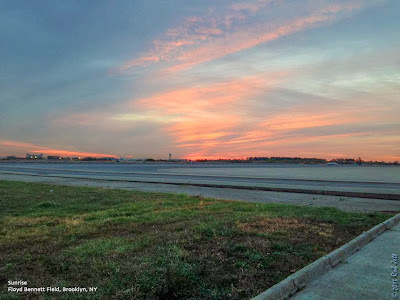 Bob, Heydi and I arrived at Floyd Bennett Field on Saturday just as the sun was coming up. Thankfully our genius elected officials in Washington decided to end the government shutdown, so this National Park was open and we didn't have to sneak in. It was a little past 7am. In 10 days we return to local standard time and sunrise will be an hour earlier. Our first stop was the small field adjacent to the "Aviator Sports" facility. In the past, this has been a good spot for migrating Buff-breasted Sandpipers and Killdeers. The only birds present on that field Saturday were Mourning Doves, a few Herring Gulls and an American Crow yelling at said gulls. From there we headed over to the cricket field, then walked the short distance to the Return-a-Gift Pond (theoretically, if you checked "Return a Gift to Wildlife" on your New York State tax return, some of that money went to the creation and maintenance of this small pond). Neither the cricket field nor the pond held any birds, but the path along the way was loaded with birds. Yellow-rumped Warblers were all over the place, as were both species of kinglet, Song, Swamp and White-throated Sparrows. A pair of Cooper's Hawks were patrolling the area and I spotted two Northern Harriers in the distance, high above the main grasslands. As we were returning to the car I spotted a Blue Grosbeak in the grass at the edge of the pathway. It flew up into a tangle of vines and began making its high-pitched "tink" call. Our next stop was at the Floyd Bennett Community Gardens. This 3 to 4 acre collection of garden plots is a magnet for migrating songbirds, especially sparrows in the Fall. We were hoping to find a Vesper Sparrow among the more common species. Tom had the same idea and we ran into him shortly after we arrived. With the extra pair of experienced eyes joining us, I was confident we'd find something good. We split up into two groups and zigzagged our way through the dozens of rows of gardens. To a seemingly nonstop soundtrack of Yellow-rumped Warbler "pips" we counted Chipping Sparrow, Field Sparrow, Savannah Sparrow, Song Sparrow, Swamp Sparrow, White-throated Sparrow, White-crowned Sparrow and Dark-eyed Junco. There was also a single Nashville Warbler that appeared amazingly bright yellow for so late in the year. 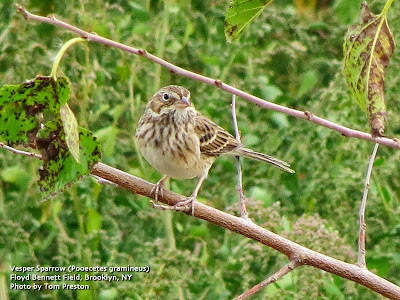 It wasn't until we arrived at the last garden plot of the last row that Tom spotted our prize - a Vesper Sparrow. Bob and I stood back and watched in amusement at Heydi and Tom's frustrated attempts at photographing this relatively large sparrow with bold, white eye-rings. As you can see by the photo here, the effort paid off. At the North end of Floyd Bennett Boulevard there is a fenced in baseball field. This season it remained unused and it has become a great habitat for birds as grasses and wildflowers flourished in both the outfield and infield. We thought it might be another great spot to search for migrating sparrows. Unfortunately, when we arrived there was a group of dog owners who decided it would be a great spot for a private dog park. 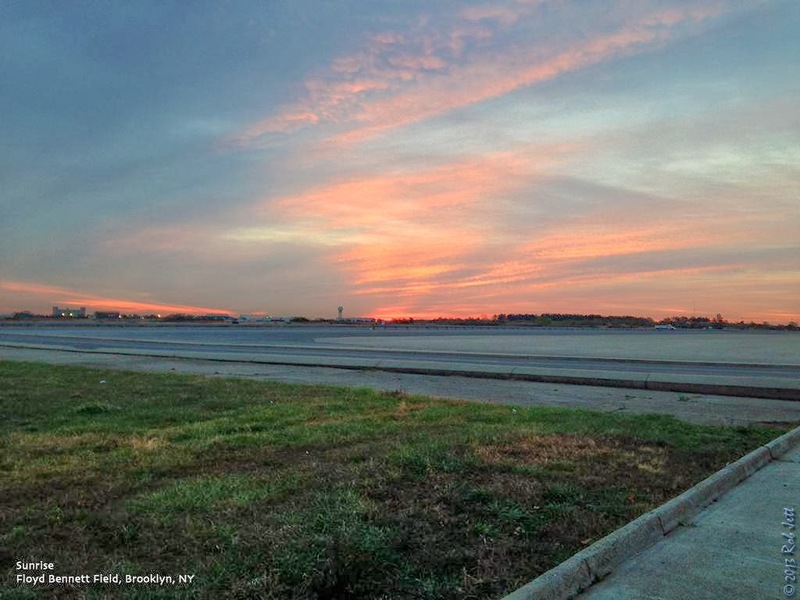 If you are wondering, no, dogs are not permitted offleash in Floyd Bennett Field. Enforcement is another story, however. We left the ball field and headed towards the edge of the water. There is a narrow stretch of grass along the Eastern edge of Floyd Bennett. It overlooks Jamaica Bay and it is in this area where Heydi and I discovered a Le Conte's Sparrow last year. We thought it might be worth checking out again. Walking North along the path through knee-deep grass, several Palm Warbler, Savannah and Song Sparrows popped up in front of us. A few minutes into our walk I received a text message from Sean, so I stepped off the path and closer to the water to reply. Earlier I had tweeted about the grosbeak and Vesper Sparrow, so his note was just acknowledging that it seemed pretty "birdy". I typed back that it was really active, then looked up from my phone to see a Short-eared Owl sitting at the edge of the water. The bird flushed and started flying out over the water. I shouted to Bob, Heydi and Tom. Heydi managed to snap off a couple of shots. I then tweeted about the owl and waited for Sean to call. It took about 5 seconds. I answered the phone laughing. It was only about 10:15am and I could have ended the day then and there. We birders tend to be a greedy lot, so instead continued for another 3 hours, although we didn't find anything nearly as interesting as the grosbeak, vesper and owl. Saturday night my wife and I went out to see a band that didn't go on until 10:30pm, so I slept late on Sunday. I decided to take it slow and just bird around Green-Wood Cemetery. Green-Wood is always a good spot for Fall sparrows and it's only a short bike ride away from my apartment. I try to pick a line along the tops of the ridges as I wend my way through the cemetery. It allows me a view of the sky, so I can also check for migrating raptors. Almost immediately I spotted a Sharp-shinned Hawk zipping through the treetops along the Hill of Graves. Just passed the Western end of the Hill of Graves I noticed a lot of bird activity near Meadow Hill. Robins, Hermit Thrushes and a single Scarlet Tanager were flying in and out of a Winged Euonymus tree. They were feeding on its abundant, orange-red berries. Several flickers joined in and a pair of phoebes hawked for insects from the top of the tree. On the grass nearby a small flock of juncos mingled with White-throated and Song Sparrows. I sat down in the sun at the base of a monument and watched dozens of birds for about 15 minutes. At one point I noticed a small sparrow in the shadow beneath the euonymus. I picked up my bins and was surprised to see that it was a Clay-colored Sparrow. Migrating primarily through the center of the country, this pretty sparrow now seems to be appearing more frequently in the East. I continued walking, first over Pine Hill, then Forest Ridge and over to Central Ridge. There were lots of kinglets, Palm Warblers, and White-throated Sparrows along the way, but nothing unusual. I stood on Central Ridge and watched a Red-tailed Hawk coming in for a landing. He picked up speed as he pulled his wings tighter to his body and tipped downward. As he approached treetop elevation, he slowly pivoted his legs forward. I imagined him opening his feet and pointing his talons outward moments before hitting his target. I heard a small flock of Blue Jays making frantic "jeer, jeer, jeer" calls from the general direction of the hawk's landing and wondered if he made a kill. Several other raptors were in the area and by the end of my nearly 3 hour walk I counted a second Red-tailed Hawk, 1 Merlin, 1 Peregrine Falcon, 4 Sharp-shinned Hawks and 3 Cooper's Hawks. The first of the season's Ruddy Ducks and Northern Shovelers have begun arriving and I suspect that in another couple of weeks there will be hundreds of them around Brooklyn. "What’s the Condition of the Pipeline Beneath the Straits of Mackinac" ... and why you should care. Please help NWF press for measures that will minimize the risk of an oil spill in the Mackinac Straits. Today's event is in collaboration with Open House NY www.ohny.org so expect a line! Guide: Gabriel Willow With NYC Parks and the Greenbelt Conservancy Meet at the Manhattan terminal of the S.I. Ferry and join us as we journey to Moses Mountain, which provides a panoramic view of Staten Island and points beyond. 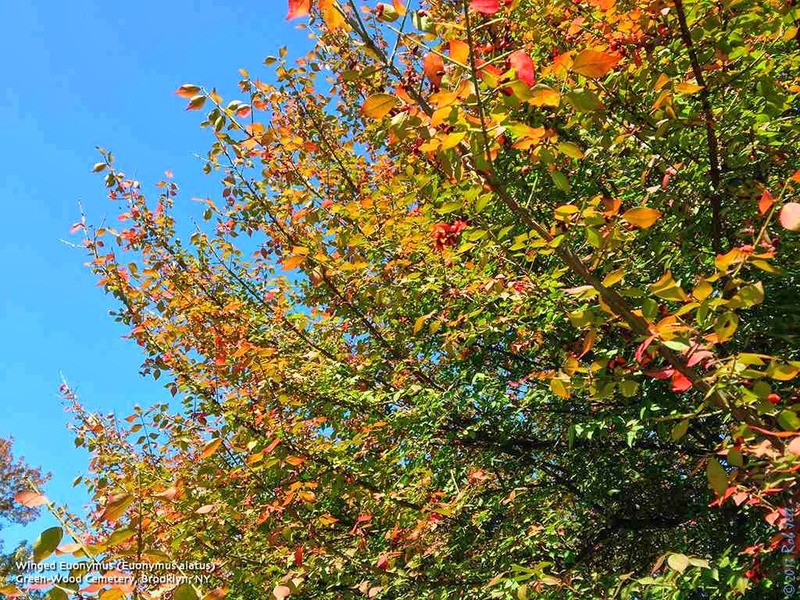 We'll look for migrating hawks, warblers, and other songbirds—with crimson sumac and other autumn foliage as a backdrop. Saturday, October 26, 2013, 2:00 p.m. to 4:00 p.m. The woodlands and ponds of this little known area will be explored during an approximately two mile hike. 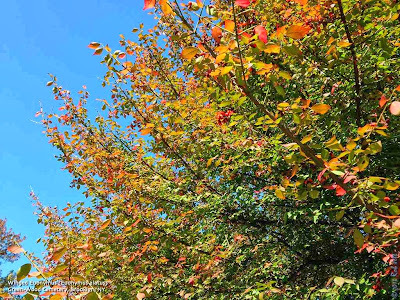 Once heavily farmed, the Acme Pond areas have developed into a nicely wooded forest over the past 150 years with sweetgum, white oaks and hickories as the dominant trees. The pond is reputed to be the home of large bass. Meet at the corner of Hylan Boulevard, and Holten Avenue. Saturday, October 26, 2013, 11:00 a.m. to 1:00 p.m. Herbs, weeds, and trees have much folklore associated with their scents, colors, fruits, and seeds. Walk through Conference House Park and the Colonial Herb Garden with herbalist Gert Coleman to learn the stories about and practical uses of elder, mugwort, fennel, oak, wormwood, and more as we separate fact from fiction. Wear walking shoes and bring a hat. Meet in the parking lot at the end of Hylan Boulevard. For more information call Gert Coleman at 718-356-9235 or e-mail gert.coleman@verizon.net. Greetings. This is the New York Rare Bird Alert for Friday, October 18th 2013 at 7pm. The highlights of today's tape are BUFF-BREASTED SANDPIPER, BLUE GROSBEAK, LARK SPARROW, CLAY-COLORED SPARROW, RED-NECKED GREBE, SORA and more RED-HEADED WOODPECKERS. A fairly lackluster week was highlighted by a BUFF-BREASTED SANDPIPER last Monday on the East Pond at Jamaica Bay Wildlife Refuge. The bird ultimately pushed off due to falcon harassment. Other shorebirds on the East Pond and the now reopened refuge have included WESTERN SANDPIPER and WHITE-RUMPED SANDPIPERS and TRICOLORED HERON was still at the bay Tuesday. 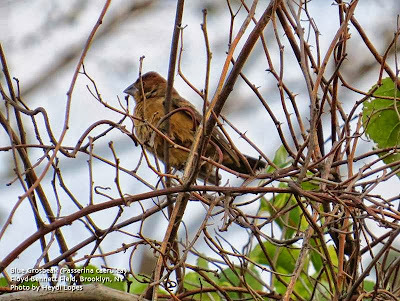 At Kissena Park in Queens a BLUE GROSBEAK was present in the corridor from Sunday to at least Wednesday with an ORANGE-CROWNED WARBLER also there Wednesday. A mature RED-HEADED WOODPECKER was noted in that park Tuesday and Thursday this species continuing its excellent run locally this Fall. Other RED-HEADED WOODPECKERS during the week featured an increasing number at Pelham Bay Park in the Bronx with at least 4 there Tuesday and later near Turtle Cove and another in Central Park Sunday. Two were also at Inwood Hill Park in northern Manhattan today. A SORA in the swamp along Prospect Park Lake last weekend, apparently a different bird from the one present a week earlier, was not as unexpected by location as the one frequenting flower beds in Bryant Park in Manhattan from last Friday through yesterday. A HOODED WARBLER was also in Prospect Park from Sunday to at least Thursday. Drier Offerman Park (Calvert Vaux Park) in Brooklyn has had a nice run of birds recently. RED-NECKED GREBE was present in Coney Island Creek there from Saturday to Monday and Saturday also added ORANGE-CROWNED WARBLER and LARK SPARROW with a CLAY-COLORED SPARROW there Monday. Another ORANGE-CROWNED WARBLER was reported on Staten Island Monday and another CLAY-COLORED SPARROW was at Zach's Bay at Jones Beach last Saturday and 3 ROYAL TERNS were at Jones Beach West End. NELSON'S SPARROWS continue in fairly good numbers along coastal marshes some recent locations including Plumb Beach in Brooklyn, Pelham Bay Park in the Bronx, Marshlands Conservancy in Westchester and Gardiner's County Park in Bay Shore as well as Cupsogue County Park and presumably all along Dune Road for instance on eastern Long Island. NPR did a great piece on one thing that President Obama can do now, while the federal government is shutdown: Block the Keystone Pipeline! Journalist Ryan Lizza says there's one far-reaching, controversial issue President Obama will soon get to decide all by himself, without having to ask Congress. He alone can approve or reject construction of the Keystone XL pipeline, designed to take heavy crude oil extracted from Alberta, Canada, through America's heartland to refineries on the Gulf Coast. The oil here isn't conventional oil, Lizza tells Fresh Air's Dave Davies: "It's not really oil at all, it's oil sand -- it's basically a mixture of oil, sand, water and some other clay deposits, and to extract that oil from this asphaltlike mixture, it requires a lot of energy." Many environmentalists believe that blocking the Keystone pipeline is critical to addressing climate change. They worry that extracting, refining, selling and burning this oil will result in so much greenhouse gas in the atmosphere that it will dramatically change the climate to the point of no return. Meanwhile, proponents say it will make an important contribution to energy independence. In a recent piece in the New Yorker Lizza explores the argument that the pipeline will have a major environmental impact and profiles a billionaire former hedge fund owner who has thrown himself in the battle to stop Keystone XL. They basically have two methods for getting [the oil]: In places where it's close to the surface, they can essentially strip mine it. ... About 20 percent of this massive area in Northern Alberta they can strip mine. The other 80 percent -- the oil sand -- is deep below the ground. And it's covered by a capstone -- basically rock. ... [Extracting that oil is] an even more energy-intensive process than the mining. You're emitting a lot of greenhouse gases in the process, and so the reason it's so controversial is that a lot of smart climate scientists have pointed out that if we start exploiting all of the world's unconventional oil, we're not going to be able to solve the climate change problem. It's really that it's stickier [than conventional oil]. When it's at room temperature this stuff has the consistency of almost peanut butter, [and oil producers] have to heat it up to get it to flow. They have to mix it with another substance to get it to actually flow through the pipeline. This is why industry and government calls this stuff "oil sand" and a lot of activists call it "tar sand." The reason it got the name "tar sand" is it does look like a tarlike substance. It's not as viscous as conventional oil, unless you add chemicals to it or heat it up. So when it spills, it just sort of creates this tarry mess that is much more difficult to sop up than traditional oil. In the elections of 2010 the Republicans took over the House of Representatives, and the mood in Washington, especially with the still-struggling economy, became very, very hostile to doing anything that looked like putting a price on carbon. Obama himself stopped talking about it, so I think a lot of environmentalists were searching for a galvanizing issue that would both bring activists together but also seize the attention of the public, and I think that's really why Keystone became such a big deal at that moment. There's a debate among environmentalists of whether it was the right move. There are plenty of environmentalists who think that the most important thing they should be doing is demanding very aggressive EPA regulations on power plants and that would have a far bigger effect on reducing greenhouse emissions than stopping this pipeline. But the pipeline sort of took on a life of its own when there wasn't much else going on about climate change. Calgary is a city built on this resource. Calgary is like a classic boom town; all of the skyscrapers in Calgary are named after the energy companies that are extracting the oil from the oil sands, or the banks that are funding them. There are construction cranes all over. And Canada ... is defining itself as an energy superpower. I think it surprises a lot of people to hear they have the third-largest oil reserve in the world, behind Venezuela and Saudi Arabia. What you find in Calgary, in Canada, is a lot of industry officials scratching their heads and not really understanding why they have become the face of climate change for the environmental community. ... The big thing they're trying to do now after dealing with the campaign against Keystone and the campaign against extracting oil from the oil sands -- they're spending a lot of time both for real and, frankly, for PR purposes, trying to reduce the amount of carbon that is emitted in extracting this oil from the ground. Now some people might look at that and say, "That's like trying to get someone to lose weight by going from Big Macs to Quarter Pounders with Cheese; the whole point is to stop taking it out of the ground." ... Environmentalists look at this and they think it's mostly PR. The process requires that other government agencies weigh in on whether the State Department got this right or not. The EPA quickly challenged that market analysis and said, "You know what? We're not convinced that the State Department got this right. We don't think they're looking at the latest information and the latest data and we're not so sure that it's true that this oil will get to market absent the Keystone pipeline." And that was a big moment for the EPA, a very gutsy moment. I think there's an important moment here for Barack Obama if he chooses to take it -- even if he thinks that denying the permit to build Keystone won't have a huge impact on greenhouse gas emissions -- he could use it as a symbolic turning point in the kind of energy future he wants America to have. That is, he might say, "At some point we have to move away from fossil fuels and I'm using this moment to lead a crusade in America to move away from fossil fuels." Join the American Littoral Society's Northeast Chapter for a fall hike in Breezy Point, Queens, the little known western tip of the Rockaway Peninsula. Meet at Building 1 in Fort Tilden, Queens and carpool to Breezy Point. This tour will be led by naturalist and local expert, Mickey Cohenn. Highlights will include dune foliage, shorebirds and a surprising assortment of rocks and minerals used in the construction of the Breezy Point Jetty. This hike is free and open to the public. Please RSVP to: bmcohen2@gmail.com. Location : Meet at Fort Tilden, Queens, then carpool to Breezy Point. Guides: Gabriel Willow, Hawk Mountain raptor educator Come to Hawk Mountain with NYC Audubon! Mid-October is the perfect time to visit Hawk Mountain, one of the premier hawk-watching locations in the East. A Hawk Mountain educator will introduce us to the great variety of raptors that may be seen, including golden eagles, buteos, and falcons--and Gabriel Willow will be on hand to help with bird ID throughout the day. The path to the official hawk watch site is a 3/4-mile hike through lovely mountainous woodland. Bring lunch, water, and binoculars. Group program, trail admission, and transport by coach included. Participants may also arrange their own transportation. Transportation option limited to 30. 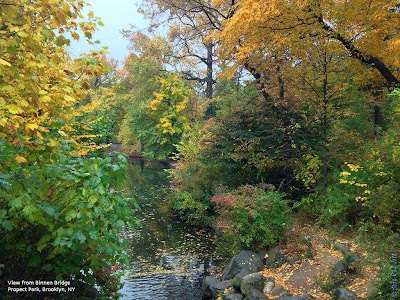 Saturday, October 19, 2013, 10:00 a.m. to 2:00 p.m.
Meet in the Nature Center parking lot at Rockland Avenue and Brielle (additional parking at the Recreation Center nearby). We will remove invasive shrubs from areas adjacent to the Nature Trail. Protectors will supply tools, gloves and refreshments. After a two hour work session (our 207th monthly workshop), we will take a short walk over nearby trails. Sunday, October 20, 2013, 10:30 a.m. to 3:00 p.m.
We’ll walk 4.3 moderate miles starting and ending at the Greenbelt Nature Center, with lunch at High Rock. This walk includes a gradual climb up Moses’ Mountain. Bring ample water and lunch. Wear a long-sleeved shirt, comfortable pants and a hat. Meet at 10:30 a.m. sharp at the Greenbelt Nature Center on Rockland and Brielle Avenues. Rain postpones the event to the same time on Sunday, October 27. Greetings. This is the New York Rare Bird Alert for Friday, October 11th, at 11:00pm. The highlights of today's tape are WESTERN KINGBIRD, AMERICAN AVOCET, HUDSONIAN GODWIT, WILSON'S PHALAROPE, AMERICAN GOLDEN-PLOVER, CASPIAN TERN, LARK SPARROW, CLAY-COLORED SPARROW, BLUE GROSBEAK, SORA, and RED-HEADED WOODPECKER. A decent week, sprinkled with some nice birds, though hampered again by easterly components to the winds, was highlighted by a WESTERN KINGBIRD appearing last Sunday near the turnaround at Jones Beach West End. Present much of the day, we have no subsequent reports of the bird. Other birds at Jones Beach West End featured a flyover AMERICAN GOLDEN-PLOVER on Saturday. Shorebirds gathered on the bar included WESTERN SANDPIPER and SEMIPALMATED SANDPIPER, and a YELLOW-BREASTED CHAT popped up in the hedgerow by the Coast Guard Station. Over 300 BLACK SKIMMERS have also been visiting the bar at West End, with two ROYAL TERNS there Saturday, when an immature RED-HEADED WOODPECKER appeared around the turnaround, followed by a BLUE GROSBEAK there on Wednesday. Last Sunday, an AMERICAN AVOCET was found near Captree State Park, while over the bridge at Robert Moses State Park, two ORANGE-CROWNED WARBLERS reported near the hawk watch Saturday were apparently replaced later in the morning by two YELLOW WARBLERS. An excellent PEREGRINE flight was captivating the hawk counters there. Seen offshore at Robert Moses State Park last weekend were many scoters on the move, a small number of jaegers, and on Sunday, over 30 CORY'S SHEARWATERS, with LESSER BLACK-BACKED GULL and ROYAL TERN also noted on both days. 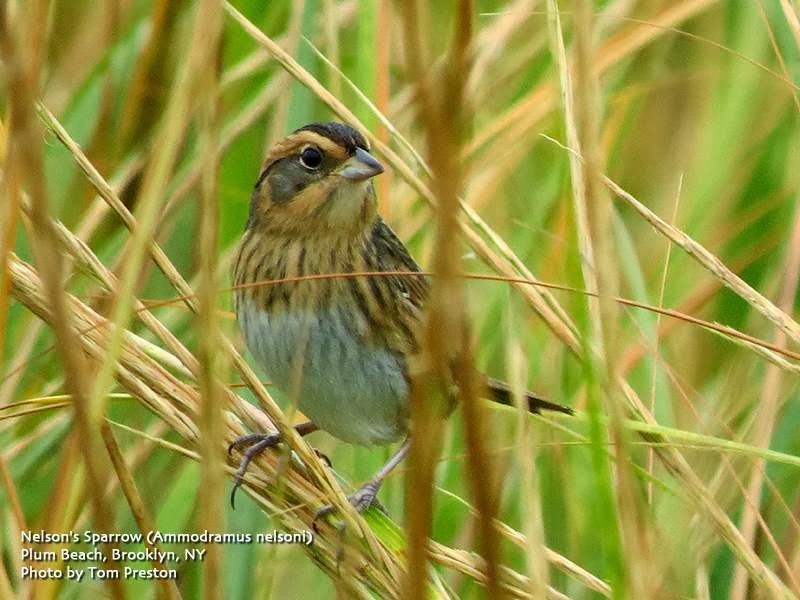 At nearby Gardiner's Park, two CASPIAN TERNS flew by the beach on Saturday, and some NELSON'S SPARROWS were frequenting the salt marsh there, with inland as well as coastal races represented. This species can also be found at such Brooklyn sites as Marine Park and Plumb Beach, and presumably at other appropriate marshes along the shores of Long Island and Westchester. 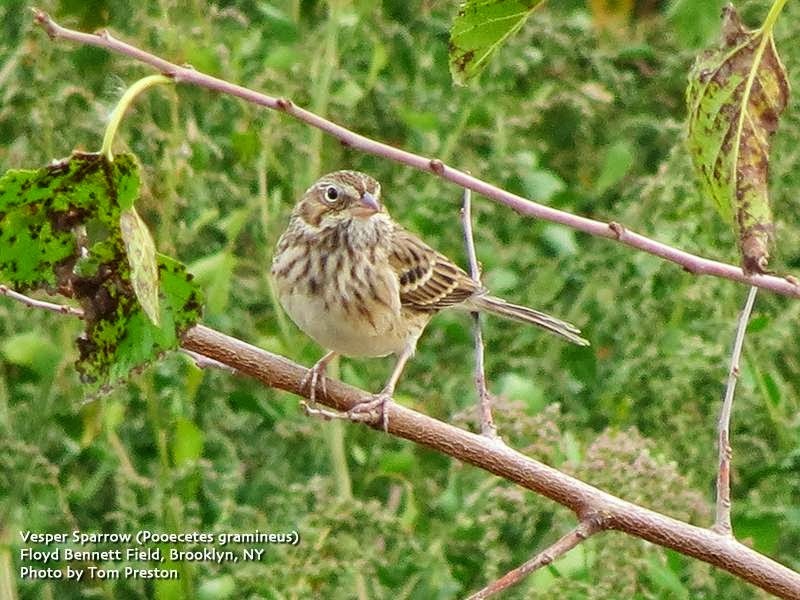 Both LARK SPARROW and CLAY-COLORED SPARROW were reported last Saturday from the Native Plant Garden at the New York Botanical Garden in the Bronx, and a LARK SPARROW found yesterday at the Great Hill in Central Park was still present today. 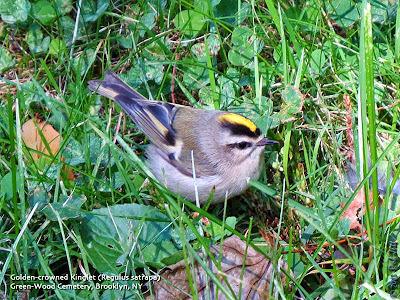 Another CLAY-COLORED SPARROW was at Marine Park in Brooklyn last weekend. A SORA was still at Prospect Park Lake last Saturday, and this was followed by a more disoriented SORA seen in Manhattan's Bryant Park today. On Tuesday, RED-HEADED WOODPECKERS were noted in several locations, including three together at Owl's Head Park in Brooklyn, and singles in Central Park and Caumsett State Park; these in addition to one at Pelham Bay Park last weekend that increased to two on Wednesday. 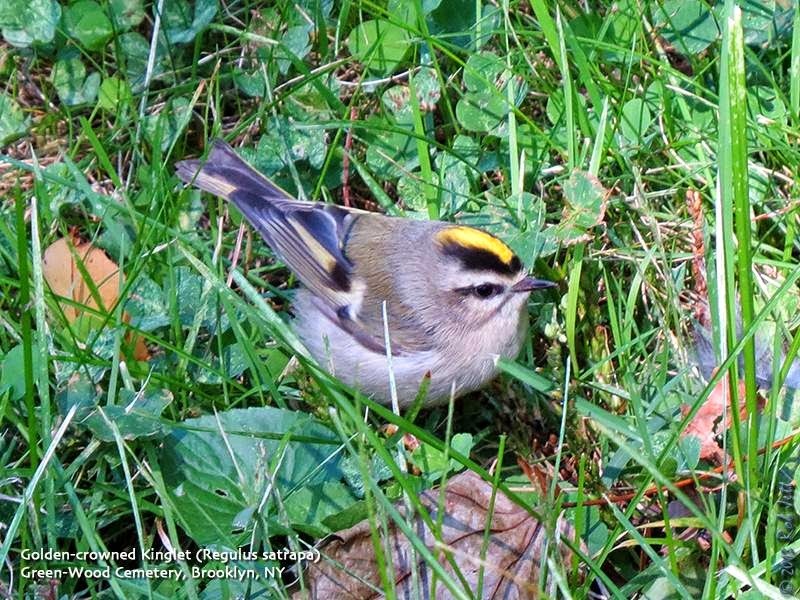 A YELLOW-BREASTED CHAT was reported in Central Park Sunday and Tuesday, but the most unexpected land bird in New York was probably the Eurasian Linnet spotted in the Kissena Park Corridor in Queens on Wednesday, this presumed escape seen again there today. At now-closed Jamaica Bay Wildlife Refuge, a WILSON'S PHALAROPE was noted at the south end of the East Pond last Sunday and Monday, followed by an HUDSONIAN GODWIT there today. On eastern Long Island a rufous-type selasphorus hummingbird has been at a private feeder in Southold recently, reminding us that it is again vagrant hummingbird season. 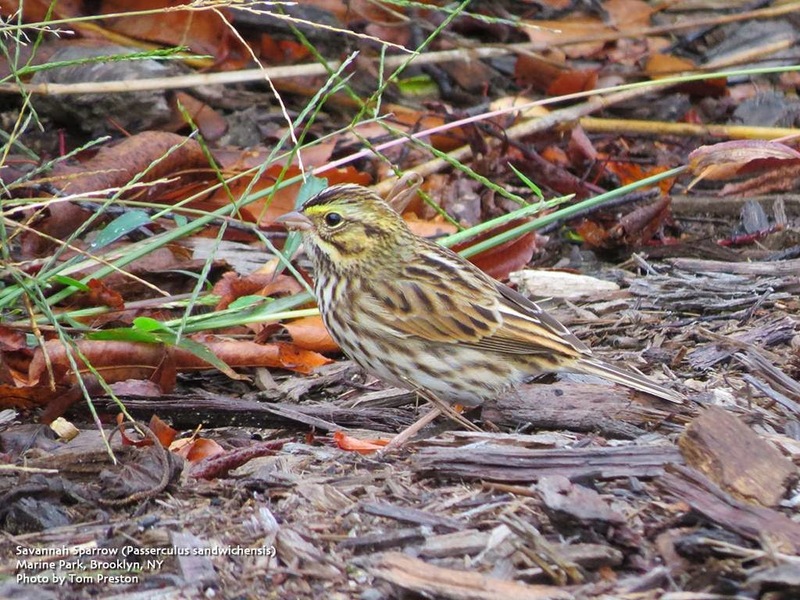 Two DICKCISSELS were at the Community Garden in East Hampton last Saturday, and two COMMON EIDER visited Shinnecock Inlet on Tuesday. Yesterday, 21 AMERICAN GOLDEN-PLOVERS were counted on a Cutchogue field off Oregon Road near Depot Lane. About 50 AMERICAN PIPITS were there today. Last weekend I noticed a profound shift in the groups of birds migrating South through Brooklyn. Up until last weekend we had been seeing a lot of warblers stopping off in our area to rest and refuel before continuing to their wintering grounds. It is fairly typical that by this time of year we'd experienced our first frost, the insect numbers plummet, and flycatchers and wood-warblers numbers noticeably drop off (except for the half-hardy Yellow-rumped Warbler, which virtually inundate our area around now). We now begin the next phase of Autumn migrants. There are still many sources of fruit for the fruit-eating birds, such as, thrushes, tanagers and waxwings. 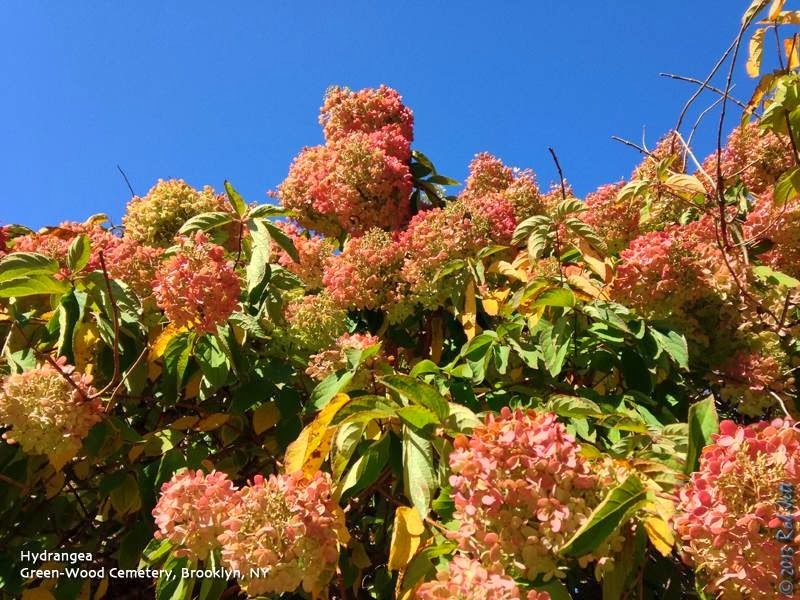 In Green-Wood Cemetery, fruiting dogwoods have attracted hundreds of birds. In addition, grasses have gone to seed, creating a food source for many sparrows. Last Saturday the latter group became the target for Heydi, Tom and I as we spent from dawn until early afternoon searching Brooklyn's sparrow haunts. After a sunrise run into Prospect Park where we successfully relocated the Sora that had spent the week near the lake, we headed over to Plum Beach. That location is a tiny remnant of the dune and marsh habitat that once dominated coastal Brooklyn. Here's a link to an animation I created of the Brooklyn coast from 1891 to present. Anyway, we were hoping to find several sparrow species associated with this type of habitat: Le Conte's Sparrow, Nelson's Sparrow, Saltmarsh Sparrow and Seaside Sparrow. Le Conte's is very rare around Brooklyn, but last weekend was the right time of year to search (Doug spotted one here on 10/08/08, and Heydi and I spotted one across Plum Channel on 10/6/12), plus a cold front had just moved through the area, increasing the chances of new birds moving into our area. I love wetland habitat, especially early in the morning. The sounds are great; gulls randomly crying as they stand along the edge of the beach. The whistling cry of plovers as they pass overhead. The happy, gurglings call of Marsh Wrens as they perch, legs splayed, from stalks of tall marsh grass. The loud "kek, kek, kek" of Clapper Rails as they strut, hidden from view, through their muddy domain. I even enjoy the smell of the salt air wafting over the marsh and mixing with the slightly sulfurous fragrance of the mud and grass. We spent nearly 2 hours at Plum Beach surveying the birds. Nelson's Sparrows seemed to be all over the marsh. Our official count was 10 individuals, but I'm sure there were many more (Plum Beach is one of the best places in Brooklyn to find this species during Fall migration). We also spotted a single Seaside Sparrow and one or two Saltmarsh Sparrows. Our highlights here were Clapper Rail, Black-bellied Plover, Peregrine Falcon (chasing a pigeon over, then through the trees that border the marsh), Marsh Wren, Nelson's Sparrow, Saltmarsh Sparrow, Seaside Sparrow and White-crowned Sparrow. We were also pleasantly surprised to see a flock of 8 Blue-winged Teal swimming around in the high-tide flooded marsh. From Plum Beach we headed East along the coast to the Marine Park Saltmarsh Nature Center on Gerritsen Creek. Keir had spent most of his morning here and we'd been texting back and forth comparing our sightings. His highlight had been a Dickcissel, which Tom had never seen in Brooklyn. That was part of our motivation for going there, plus, it is just a really good place to look for sparrows. 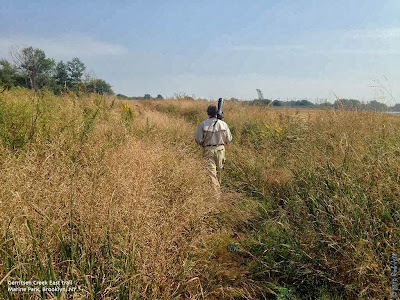 There is marsh grass habitat close to the creek and longer grass in an upland area, plus an open field dominated by low shrubs, grasses and wildflowers...perfect for several species of sparrow. As we walked along the trails at Marine Park, dozens of sparrows popped up from the grass and took flight. Swamp Sparrows were now migrating and were the most abundance species we encountered, and by a wide margin. There's a large field off the Eastern-most trail. It's bordered by 2 baseball fields to the North, East 38th Street to the East and a buffer of mature deciduous trees at the edge of the golf course to the South. 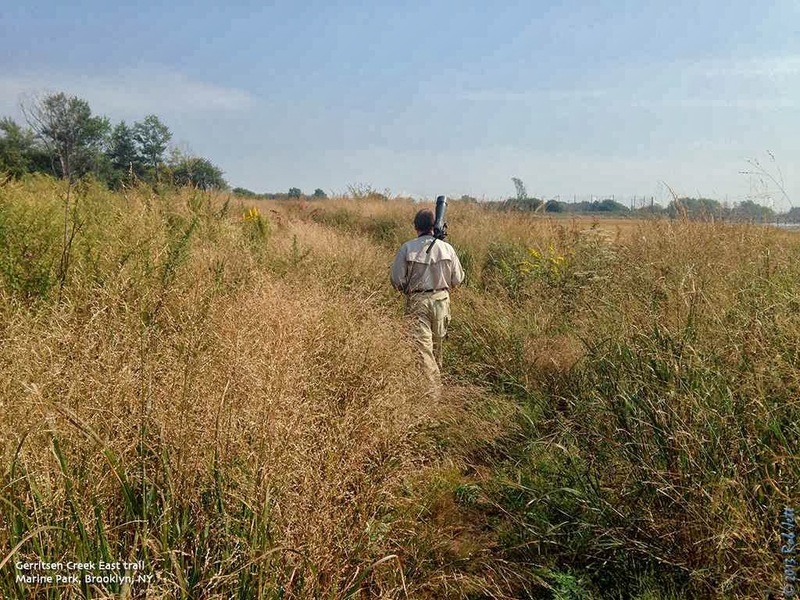 The field used to be dominated by mugwort and other invasive plants, but has been replanted with native grasses, wildflowers, shrubs and a few saplings. It is perfect habitat for sparrows. In fact, it was so active, that we almost forgot about looking for Keir's Dickcissel. As we slowly worked the South end of the field I spotted a rare Clay-colored Sparrow among the numerous Savannah, Song, Swamp and White-throated Sparrows. After a little over 2 hours birding at Marine Park, I was beginning to run out of steam, but thought there was a chance for something unusual at Green-Wood Cemetery. Tom was spent, so Heydi and I continued without him. As it turned out, he didn't miss anything. We experienced much of what we'd seen earlier with regard to diversity and abundance of sparrows, with the exception of many more Chipping Sparrows. With Winter closing in, I noticed that some of our overwintering species had started arriving over the past week. More specifically: Brant, Northern Shoveler, American Coot, Yellow-bellied Sapsucker, Merlin, Red-breasted Nuthatch, Brown Creeper, Winter Wren, White-throated Sparrow and Dark-eyed Junco. It's too bad that we won't be seeing all the Winter finches that migrated South last year.